logo done by can :: vote for the logos you like and be a lamah ! Thats what I like! Great ambience and nice music (the melody line seems to be a bit too high-pitched, though). Runs smooth over here on a 8600GTS. Good job! It creates a nice atmosphere and runs smooth on a Geforce Go 7600 here. I like the way it sounds, but lacks some drums. Nice, although a little too slow for my taste. doesn't work here .. probably spritemat border textures ..
but nice indeed !!! for a over night production !!! ok 20mins later after debugging (i love debug !!!) it looks quite well .. yes really !!! and sry its been a bug in the texture allocation .. managed textures and dynamic locks ?!? think about !!! Nice cubes and music. 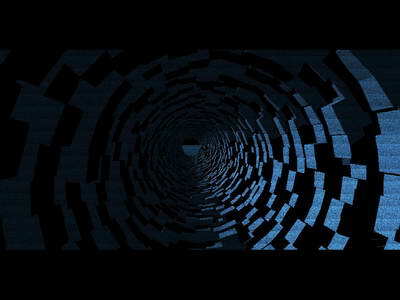 The cube-tunnel was a bit slow paced. Great atmosphere. Rare to see such small production from Poland, dobra robota kk. 4k is respect, this looks good keep em comming please. Cubes!!! And nice music as well. minimalistic style plus fitting tune !! congratulations! It looked really nice on bigscreen. Agree with others that it is a bit too slow paced, though. I liked the effect at the beginning, the rest is pretty much standard (There ARE cubes, after all ;) ). The music synth is very good! too bad that it's a slideshow for me but it rocks, trax is fine . Wow that was AMAZING, one of the best 4k demos I've ever seen. If the cubes had turned into a big walking monster at the end it would have been THE best. Absolutely crawls on my laptop (Radeon9600PRO Mobility 64MB), but it's not bad - it's not blindingly good, either. ati 9250 :) i think "old" card but..
Oh man, you touched my heart. Amazing. Really good graphics and sound. very nice, a bit slow though. Thumb up for the shadows and the synth! i loved music very much. and that last scene is simply beautifull! Ok intro. I was a bit disappointed though: where's the quantum chaos ? Yes it is slow here too (Radeon 9600 Pro, maybe a problem with ATI cards?) but I really like the music. rulez added on the 2008-11-28 07:34:51 by ɧ4ɾɗվ. page created in 0.021592 seconds with 15 queries.